The cajun popcorn is complimentary and it is really really really hard to stop nibbling on them before all the food comes out. The buffalo cucumbers are refreshing especially when you having them in between the boils. I am not a lover of cheese but if you are then you will love these cucumbers as are they are covered in blue cheese. One of my favourite snacks on the menu is the crab, black bean and chorizo ball as they aren't as oily or heavy as your typical Italian arancini balls (not that they are the exact same thing). The lobster gravy fries are strangely addictive especially with the melted stringy cheese. You can definitely smell the lobster through the gravy but not so much taste wise. I thought the lobster fries would be my favourite but the chorizo balls were just unexpectedly tasty. Last but not least are the boils. 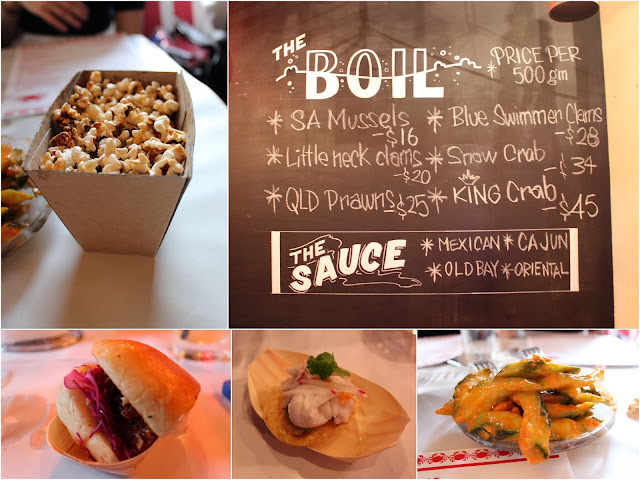 I tried the snow crab in the cajun sauce at the launch and it was amazing. 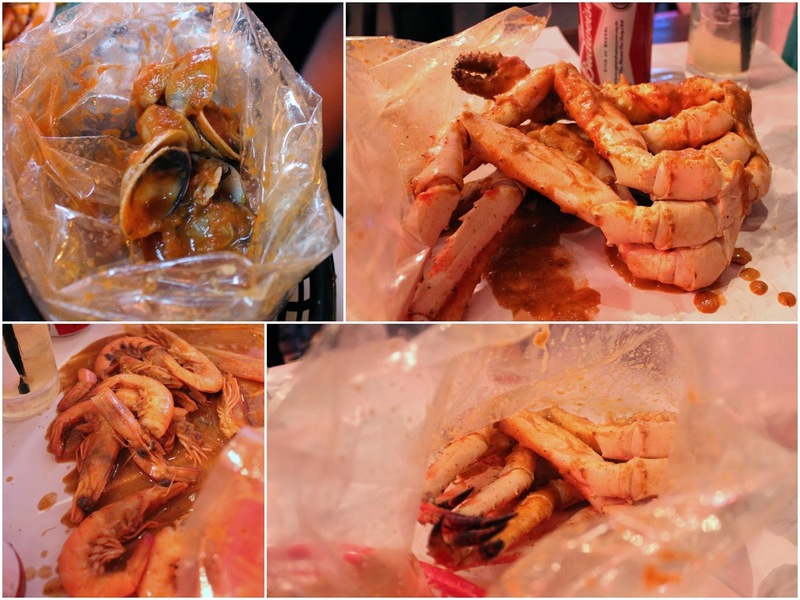 Second time I returned and the snow crab was just as magical as I had remembered it to be. The meat was soft, sweet and all sorts of deliciousness. The cajun sauce is slightly salty but the subtle spiciness in it lures you in for more. I chose to have the little neck clams with the oriental sauce and man, that is one freaking awesome sauce. It was sweet but not overly salty. The best part about it (as well as the other boils) is that when you finish the meat, you can dunk the bread into the bag to soak ALL the sauce. It's bad to waste food and sauce can be considered as 'food' right? Also, you might think that 500 grams in a boil might not sound like much given that the shells take up quite a bit of weight but there is more meat in there than you think. I went with another two girls and we ordered 3 boils plus two snacks and we were bloated by the end of the night so don't be fooled to think that 500 grams is a measly portion size. 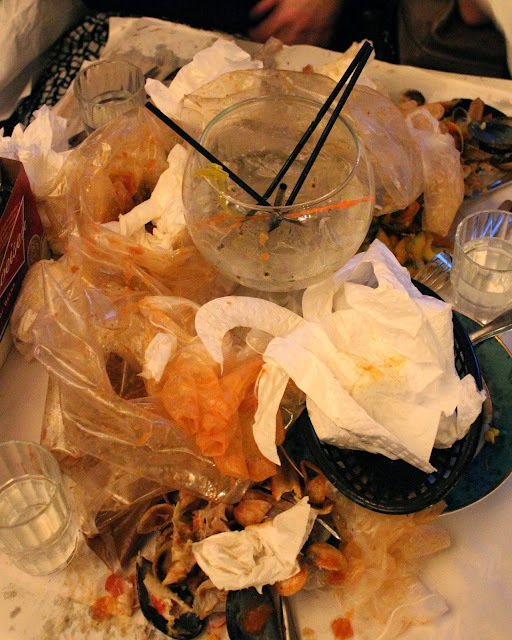 And of course, the post would not be complete without a snap shot of the aftermath.. Overall, it was a very satisfying meal esp after rolling out the door with an exploding belly. Can't wait to come back for more and roll out that door again! Oh man!! I still gotta try this joint. Hello lobster fries!!!! lol love your jazz hands! 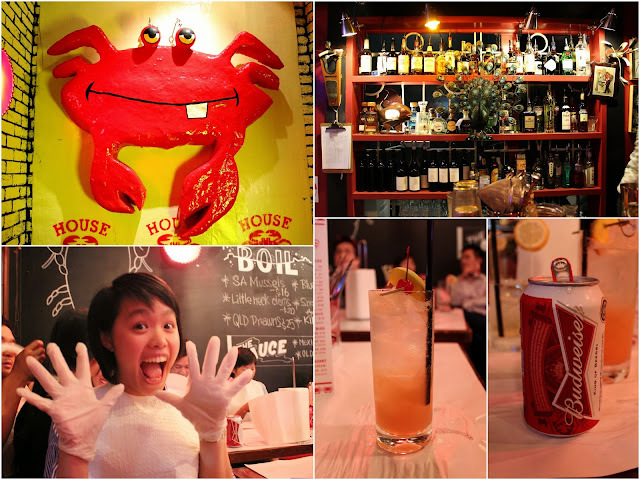 Always a rollicking good time getting down and dirty with a crab boil! Next time you gotta try their fried chicken with watermelon! melted stringy cheese :D that has my name written all over it! man I need to go back to try more menu items! Same as Raff, haven't tried it yet. 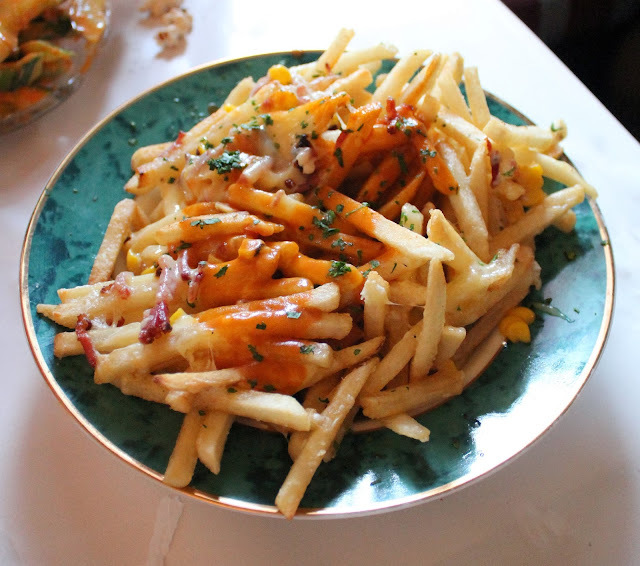 those lobster fries look so good, have been meaning to try this place for ages! Those are some great look crabs and lobster fries (mmmm . . lobster fries)!